As any parent, teacher, coach, or caregiver of a learning disabled child knows, every learning disability has a social component. The ADD child constantly interrupts conversations and doesn't follow directions. The child with visual-spatial issues loses his belongings and causes his siblings to be late to school. The child with paralinguistic difficulties appears stiff and wooden because she fails to gesture when she talks. These children are socially out of step with their classmates and peers, and often they are ridiculed or ostracized for their differences. A successful social life is immeasurably important to a child's happiness, health, and development, but until now, no book has provided practical, expert advice on helping learning disabled children achieve social success. 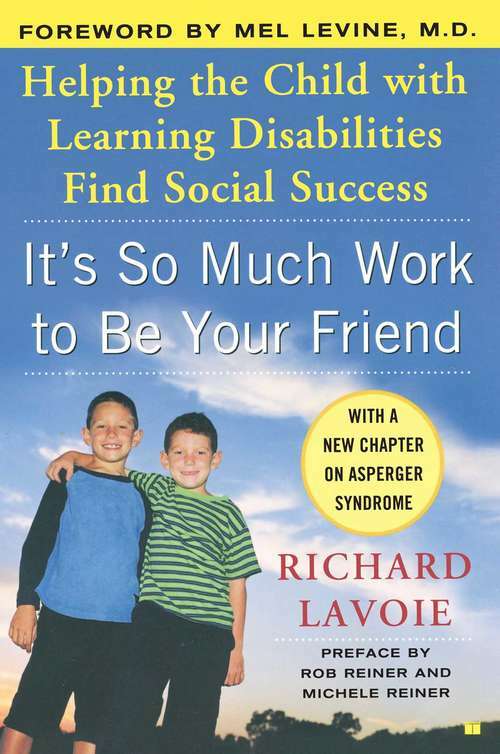 For more than thirty years, Richard Lavoie has lived with and taught learning disabled children. His bestselling PBS videos, including How Difficult Can This Be? : The F.A.T. City Workshop, and his sellout lectures and workshops have made him one of the most popular and respected experts in the field. At last, Rick's pioneering techniques for helping children achieve a happy and successful social life are available in book form. It's So Much Work to Be Your Friend offers practical strategies to help learning disabled children ages six through seventeen navigate the treacherous social waters of their school, home, and community. Rick examines the special social issues surrounding a wide variety of learning disabilities, including ADD and other attentional disorders, anxiety, paralinguistics, visual-spatial disorders, and executive functioning. Then he provides proven methods and step-by-step instructions for helping the learning disabled child through almost any social situation, including choosing a friend, going on a playdate, conducting a conversation, reading body language, overcoming shyness and low self-esteem, keeping track of belongings, living with siblings, and adjusting to new settings and situations. Perhaps the most important component of this book is the author's compassion. It comes through on every page that Rick feels the intensity with which children long for friends and acceptance, the exasperation they can cause in others, and the joy they feel in social connection. It's So Much Work to Be Your Friend answers the most intense yet, until now, silent need of the parents, teachers, and caregivers of learning disabled children -- or anyone who is associated with a child who needs a friend.